Good old Ray Mears has done it again. 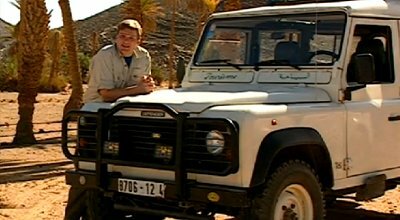 In this episode of Extreme Survival, he's in the Sahara desert with his Land Rover Defender talking through some survival tips, recovery techniques and maintenance. With Morocco being a relatively straightforward expedition destination for off roading, a desert expedition is not beyond the scope of a potential trip in your Land Rover. See the videos at the bottom. Also a great resource is a chapter from the RGS Expedition Handbook, Desert Expeditions (PDF) by Tom Sheppard. Tom has written multiple books about driving in harsh climates, not least the fabled "Vehicle-dependent expeditions"
There's a few good points to consider from his wise words. Having driven in sand myself and horrendously muddy conditions, I understand how important the mindset is of how you should drive differently than when on tarmac. Not least I see off road driving as constant obstacle puzzle that is more reliant on the driver than the vehicle. Ray uses this acronym as a way to remember your daily checks on the vehicle. When you're bogged and need to use your sand ladders, tie a piece of string to the front of the ladder and the back of the vehicle, and they will get towed behind until you can get to hard ground. Saves you going back to get them!